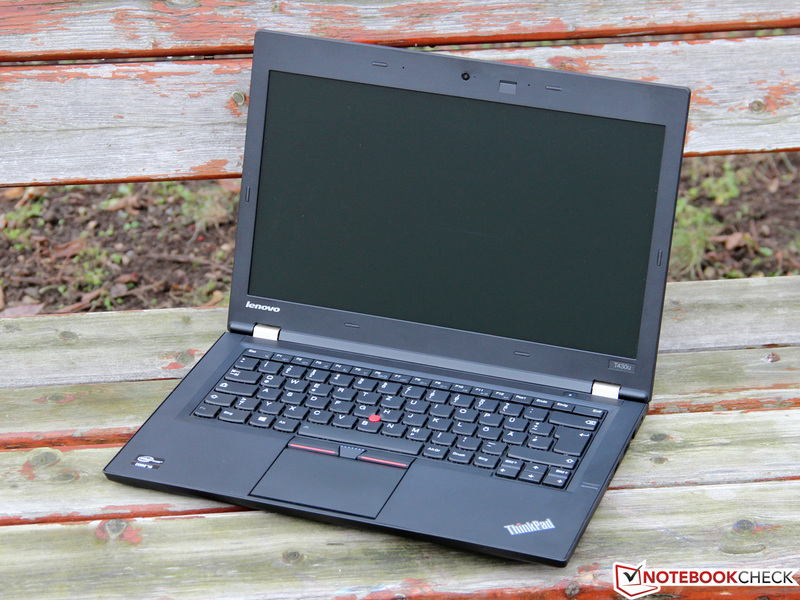 Sometimes, less is simply more – at least Lenovo seems to think so and offers a particularly slim version of the business classic T430 dubbed ThinkPad T430s. But that is not enough and the manufacturer now also enters the ultrabook range with the new, ultra-thin T430u. 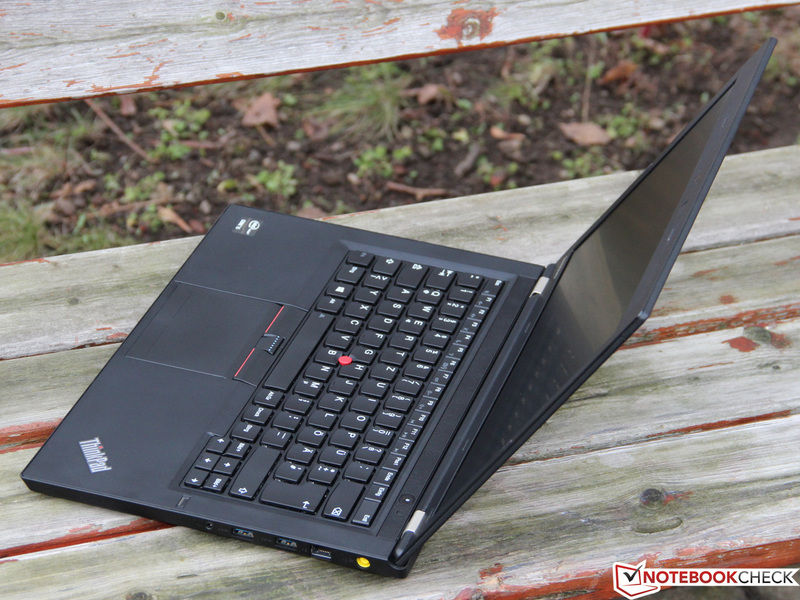 This ThinkPad is to be the perfect companion for those on the move. 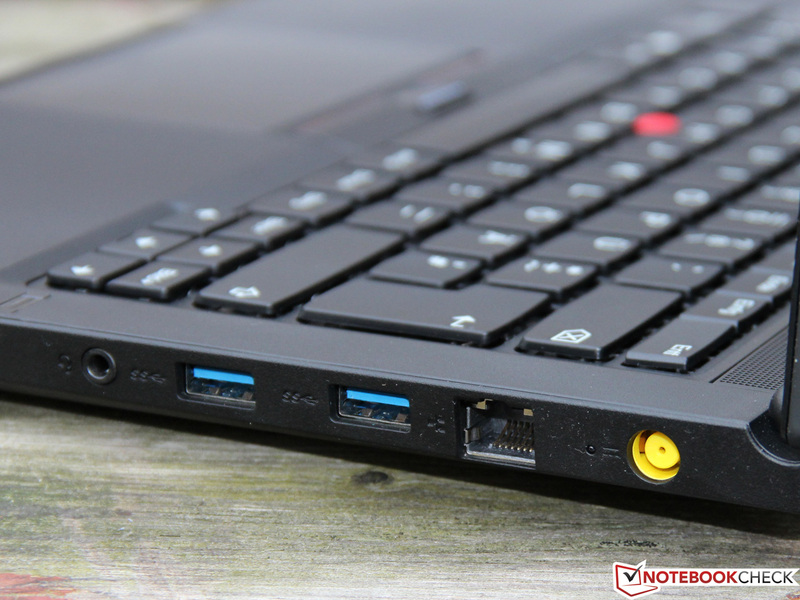 For a price of approximately 900 Euros (~$1176), Lenovo's ThinkPad T430u represents an affordable alternative to the elegant X1 Carbon. Our midrange configuration (N3F3GGE, from 950 Euros/~$1241) integrates an energy-efficient Core i5-3317U, 4 GB of RAM and a 128 GB SSD. As a special highlight, this model can also score with Nvidia's GeForce GT 620M, which promises a noticeable performance boost in contrast to the integrated Intel graphics. Not only business laptops, such as Dell's Latitude E6430s, belong to the T430u's rivals. Other, more consumer oriented ultrabooks, such as Fujitsu's LifeBook U772 or Acer's Aspire TimelineU M5-481TG, also compete. 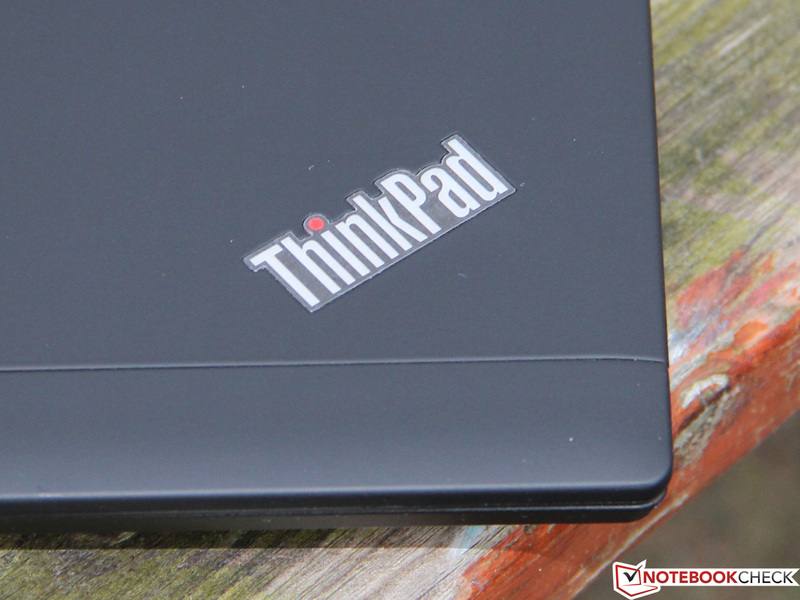 We now want to examine whether Lenovo can prevail against them in proven ThinkPad manner. Ultrabook or not, the T430u does not differ much from its bigger siblings in regard to shape or design. Its restrained looks do not exactly convey the elegance of a unibody MacBook; the motto "form follows function" comes closer. 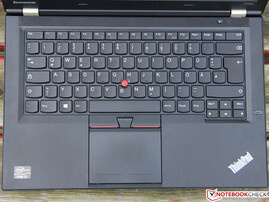 Ergonomic, matte black surfaces underpin Lenovo's claim to have consistently designed a laptop made for professional use. The buyer merely has to waive on a protecting clamshell frame and the additional display latch found in other T400 models. 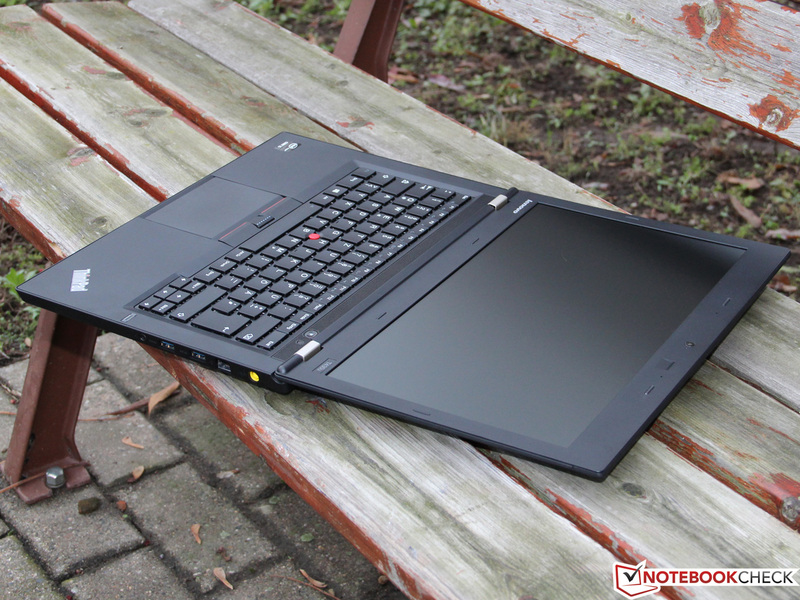 Compared with the usual ultrabook standards, the T430u is truly not a lightweight. It is even slightly heavier than the T430s with a weight of 1.87 kilograms (~4.1 pounds) and very remote from some other contenders. Fujitsu's LifeBook U772 not only weighs 500 grams (~1.1 pounds) less, but is also over 5 mm (~0.2 in) thinner than the 2.1 centimeter (~0.83 inch) high ThinkPad. Nevertheless, the T430u is a very portable device that should at least clearly be preferred over the T430(s) for regular transportation. 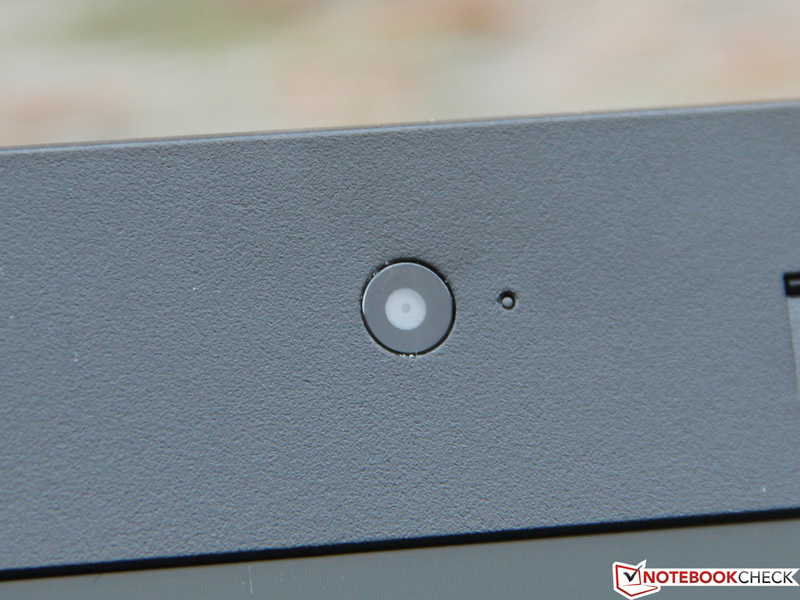 Although Lenovo relies on a fairly thick case and materials like glass fiber reinforced plastic (FRP), the stability is not completely convincing. The chassis defies selective pressure without problems, but proves to be a bit susceptible to our warping attempts. This also applies to the display that the manufacturer states has been additionally reinforced with aluminum. Some other laptops, such as Asus' UX31A, presented a slightly better performance here. 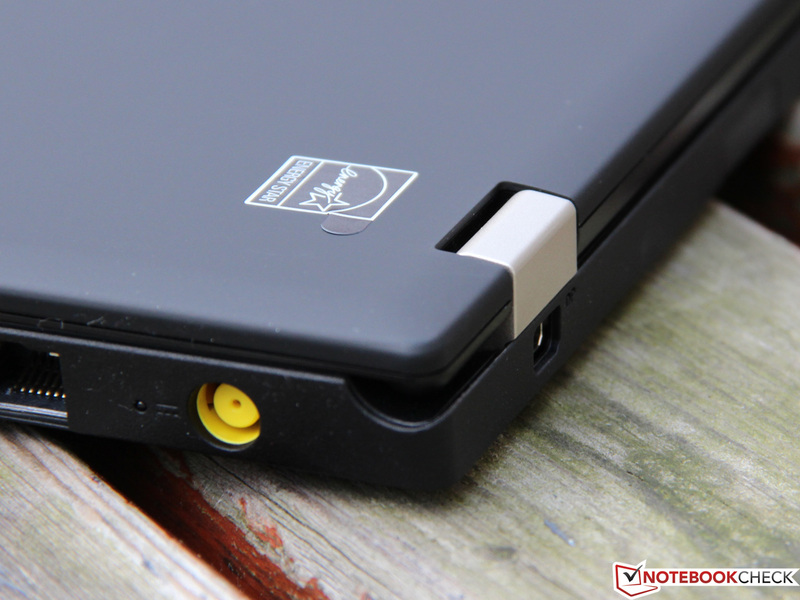 We admit that we are complaining on an exceptionally high level and do not want to forget that the ThinkPad can also score with a few advantages, for example the very precise metal hinges. This successful presentation is finished off with a meticulous workmanship that only exhibits minor weaknesses when looking closely. 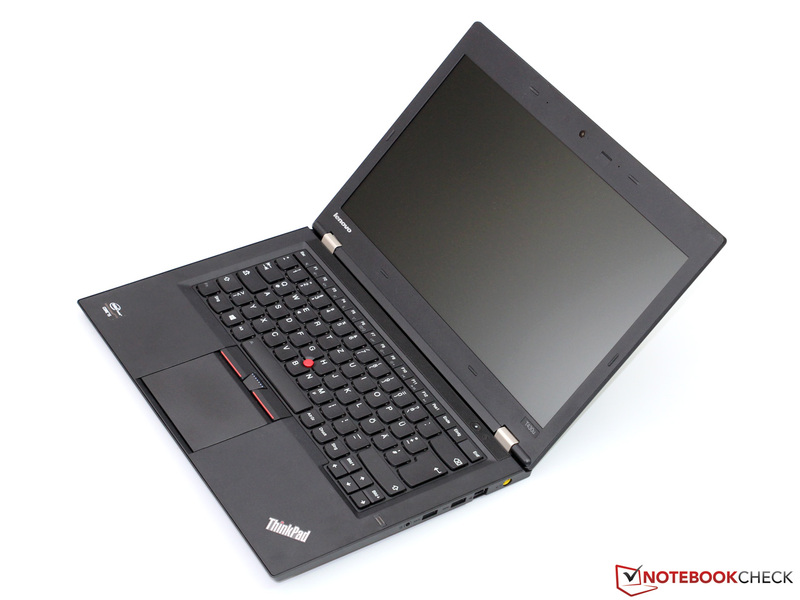 Considering its price range, the T430u has absolutely fulfilled our expectations. The casing's diet also affected the connectivity. 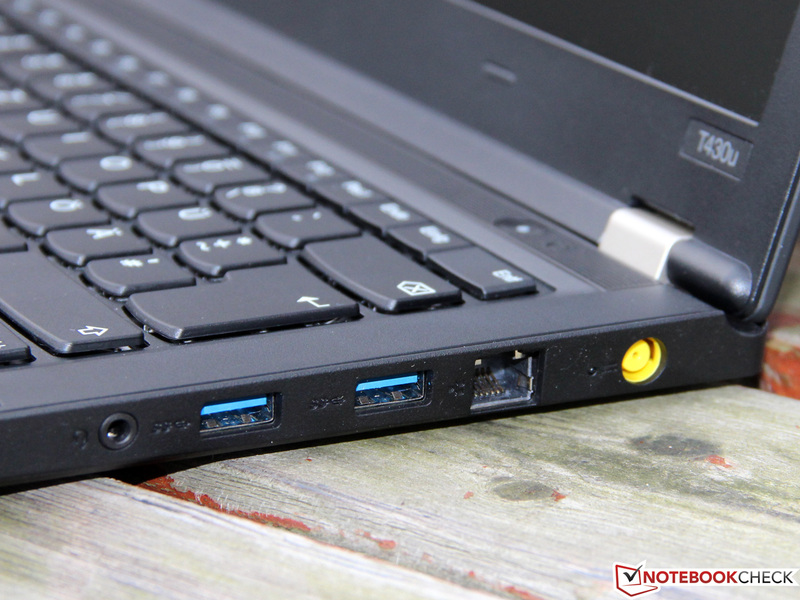 Instead of four (T430) or three (T430s) ports, the T430u only sports two, which however support the USB 3.0 standard. Nevertheless, we deem this as a bit too tight for a professional device because the user may be forced to use an additional USB hub under certain conditions. Moreover, the formerly, compulsory VGA-out has been now replaced by HDMI. This, alongside the mini DisplayPort and internal screen, enables using up to three monitors at the same time. Most of the interfaces, including GBit LAN and one audio jack, are concentrated on the casing's right. This unfortunately could occasionally result in a confusing cable mess in the mouse's action scope for right-handed users. The positioning of the display-ports at the back and the card reader (SD, SDHC, SDXC, MMC) at the left front appealed to us more. The ThinkPad T430u connects to wireless networks in IEEE 802.11 b/g/n standard via a Wi-Fi adapter from Intel. Regrettably the Centrino Wireless-N 2230 only supports the 2.4 GHz but not the less used 5 GHz band. The latter would particularly be beneficial when many WLANs are active in the direct vicinity because far more independent transmission channels are available. However, we want to emphasize the good range and fast transmission speeds (maximum 300 Mbit/s gross), which is due to the use of two antennas including multi-stream technology (2x2). Besides Wi-Fi, Bluetooth 4.0 also belongs to the standard configuration. UMTS is only offered optionally for specific models and was not available in our test device. The integrated webcam's quality is a bit disappointing. Despite a 720p resolution, minute details are either poorly depicted or completely swallowed from the intense image noise. The clear and natural-sounding array microphone provides better results and virtually makes using a headset redundant. 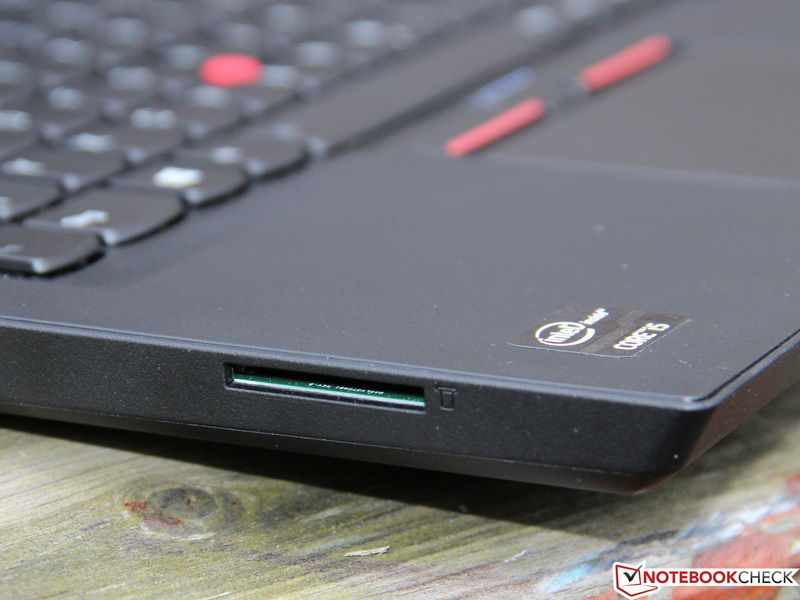 Basic security features, such as a Kensington lock or fingerprint scanner, is to protect the ThinkPad against unwanted access or theft. Moreover, the laptop is ready for Intel's Anti-Theft technology. Should the device be stolen, it can be remotely locked thus efficiently protecting sensitive data. This service has to be enabled in advance and costs approximately 30 Euros (~$39) for three years. 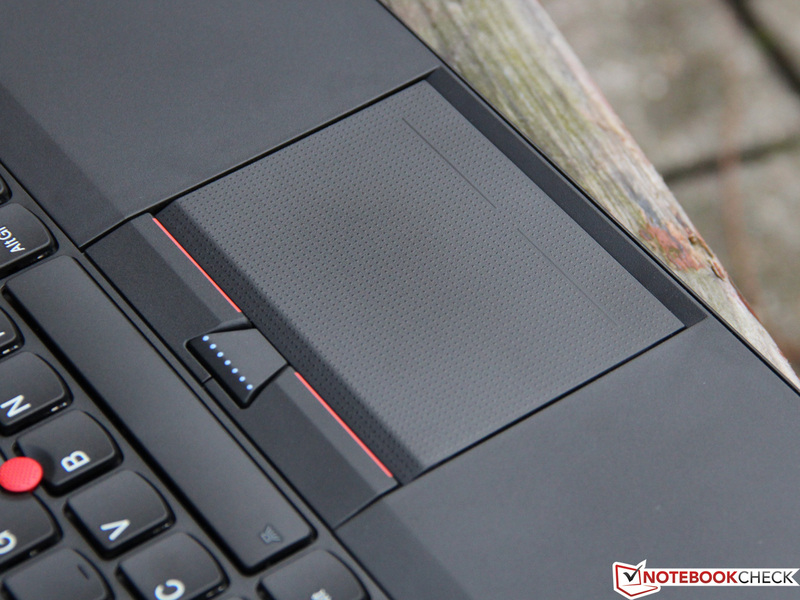 Lenovo does not include any extras and virtually delivers the ThinkPad naked. Besides the laptop, the simple packaging only contains a slim 65 Watt PSU and a quick start guide. 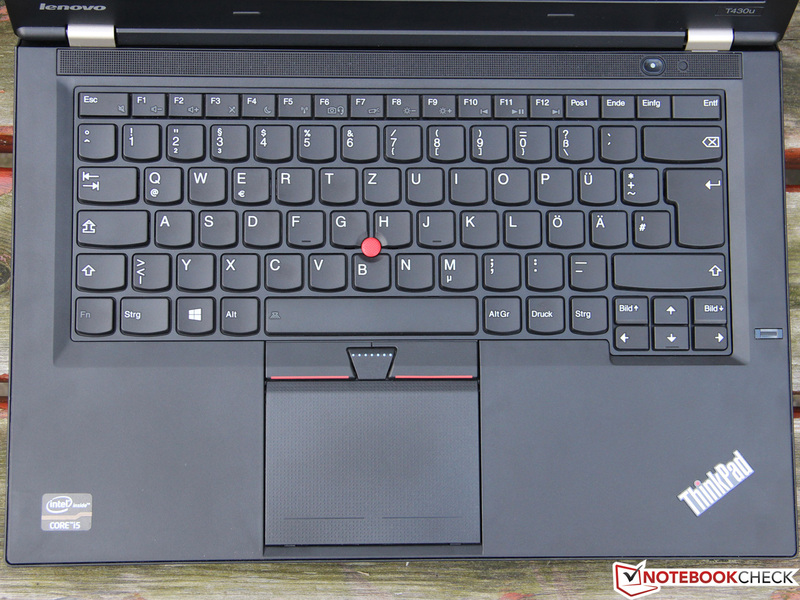 The T430u belongs to the first generation of the ThinkPad range powered by the new Windows 8. Fortunately, useless demo version activation popups will hardly distract the user. The manufacturer instead preinstalls handy tools like Lenovo Solution Center, which facilitates creating backups and provides warranty information among other things. 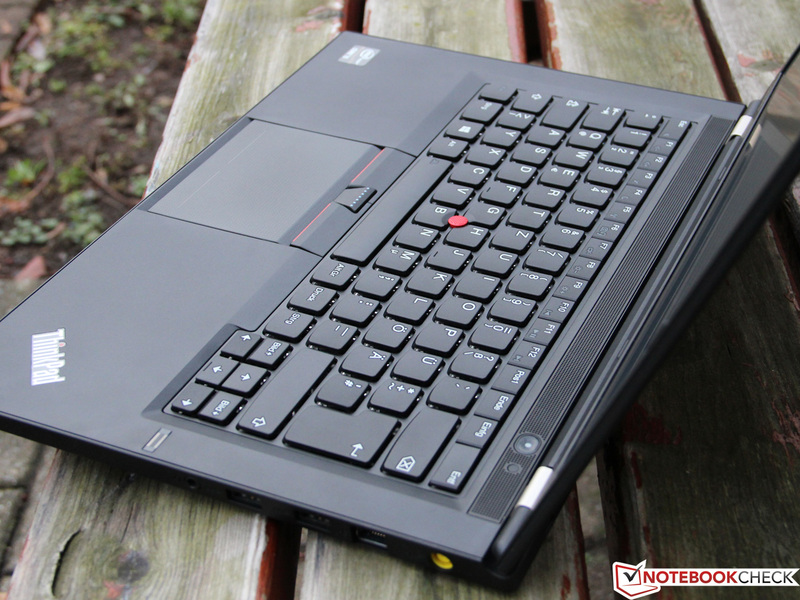 Compared with ultrabook standards, the ThinkPad is quite easy to upgrade. The base plate can be removed without a screwdriver and allows the user to access the hard disk, battery and CPU fan. A bit more effort is needed to access the working memory, mSATA/mini PCIe slot or Wi-Fi module. 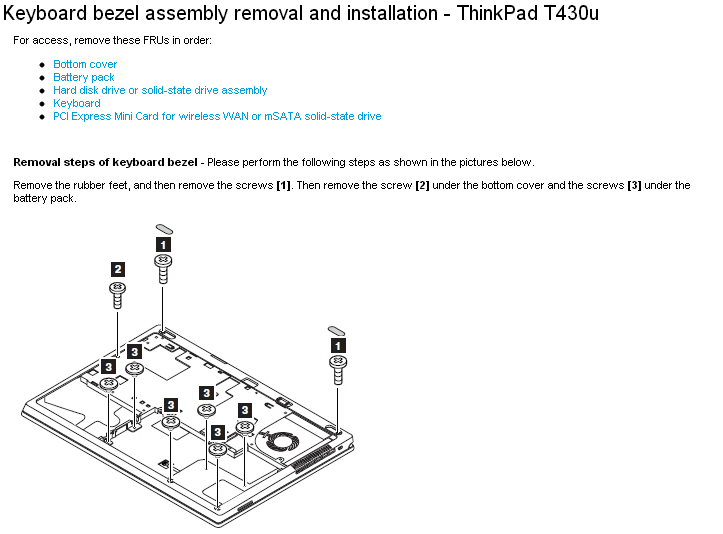 The keyboard also has to be removed for this, which Lenovo describes in detailed step-by-step instructions. We did not do this and only want to refer to the corresponding document here. 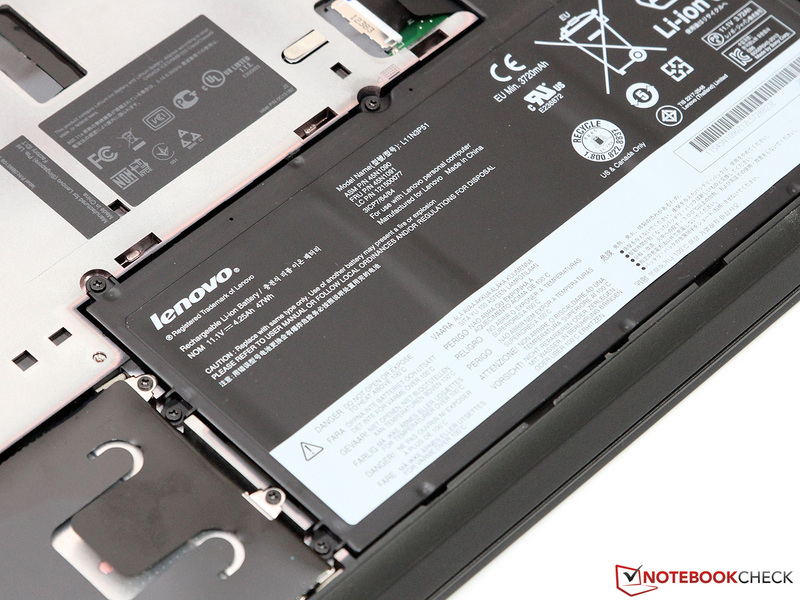 Some manufacturers can take Lenovo as an example in terms of warranty policy. The buyer receives a 36-month on-site service ex-factory. However, you have to dig deep in your pocket for longer periods. A 4-year upgrade costs 120 Euros (~$157) and at least 180 Euros (~$235) is demanded for a total of 5 years. 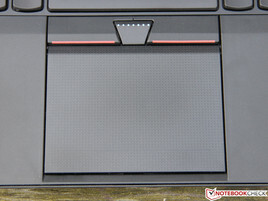 As in all newer ThinkPads, Lenovo also installs a spill-proof chiclet keyboard into the T430u which will certainly not appeal to every regular customer right away. We can however reassure you that the keyboard has not sacrificed any of its qualities with this modification. Nevertheless, users changing from other manufacturers first have to get used to the somewhat different layout, where for example the FN and CRTL key are swapped. When this short familiarization period is overcome, the keyboard presents itself from its best side. The 15 x 15 millimeter (~0.59 in), slightly concave keys are hardly missed even when typing fast and provide accurate feedback. The pressure point is comparatively firm and agreeably crisp and slightly resembles a high-end, mechanical desktop keyboard. This impression is underlined by its muffled noise that pleasantly stands out from the cheap clattering produced by some contenders. The convenient ThinkLight allows for easy usability in the dark, though the notebook does not feature a dedicated keyboard backlight. 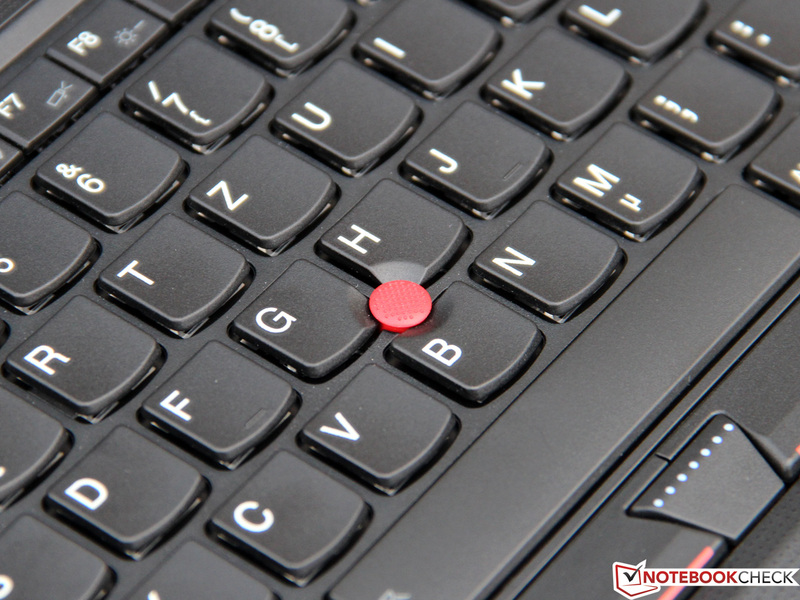 Many ThinkPad fans will prefer the traditional TrackPoint to the touchpad. Is this justified? Well, it is partly a matter of taste. In any case, Lenovo has again done an excellent job with the technical implementation. Regardless of the applied force, the cursor's speed can be controlled very precisely with the small, red joystick. The corresponding, fairly soft clicking mouse keys are located below the space bar as usual. Naturally, the aforementioned touchpad is also available as an alternative. It features an adequate size of 9.3 x 6.5 centimeters (~3.66 x 2.56 inches). The surface now exhibits a finer texture than in former models, but it still pleases with excellent precision. Rather than using dedicated mouse buttons, clicks are performed via pressing the corresponding corner on the touchpad, which is also known as ClickPad design. We would appreciate a slightly firmer pressure point and a shorter key drop. 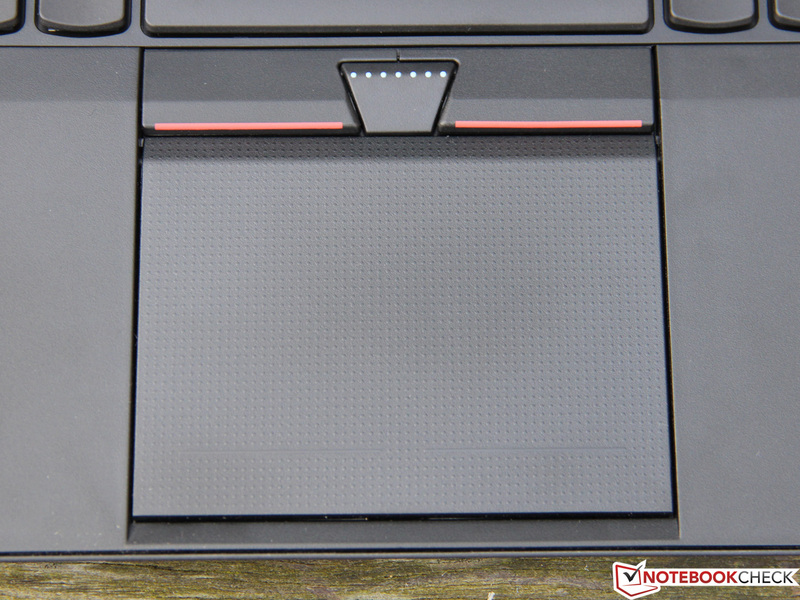 Nevertheless, the pad is a noticeable improvement to the T430/T430s. Like in Dell's and Fujitsu's contenders, the T430u's screen also has a resolution of only 1366x768 pixels. This is doubtlessly a low rate at a time when even some smartphones achieve a similar resolution. However, it is still standard in laptops in this price range. 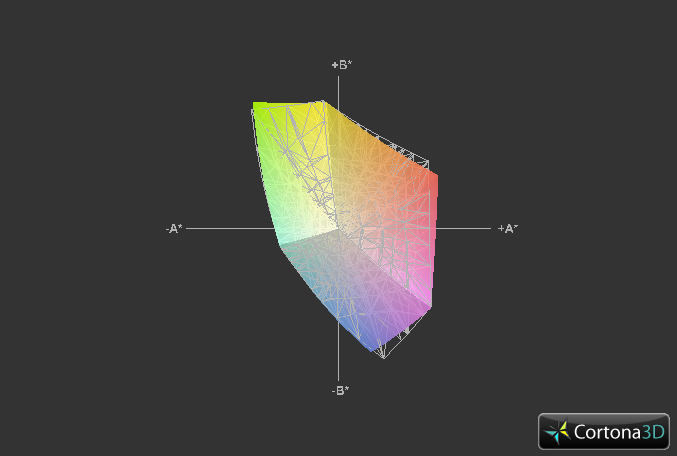 Alongside the 14.0 inch screen, it results in a pixel density of 112 dpi. 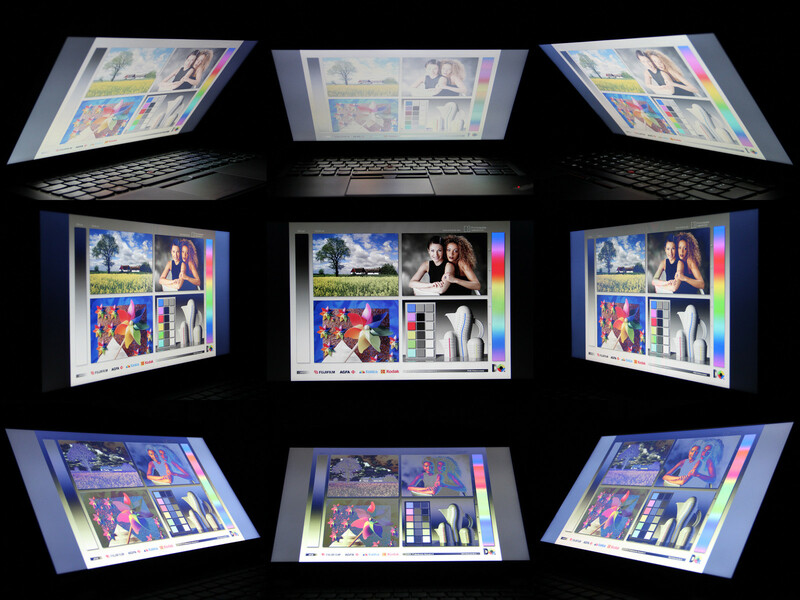 The ThinkPad also achieves only medial screen brightness rates. The LED backlight shines with an average of 173 cd/m² and our test device consequently fails the manufacturer's specification of 200 cd/m². The brightness even drops to a low 145 cd/m² in the lower left which is not noticed subjectively. The screen is at least bright enough for indoor use. As expected, Lenovo installs a low-cost TN screen, model B140XTN02 from AUO. The measured black value of 0.83 cd/m² and contrast ratio of 227:1 are thus only in the lower midfield and results in a fairly pale reproduction. However, we see a similar performance from the direct contenders. Nevertheless, it would be appreciated if Lenovo would offer a screen with higher resolution and richer contrast for a surcharge - preferably an IPS screen. If you are considering using the T430u for professional purposes, you should fall back on an external monitor. The integrated screen only covers 57 percent of the sRGB standard, which is usually too little for graphic designers. The color spectrum and accuracy is however absolutely sufficient for occasionally looking at vacation pictures, watching movies or playing a game. 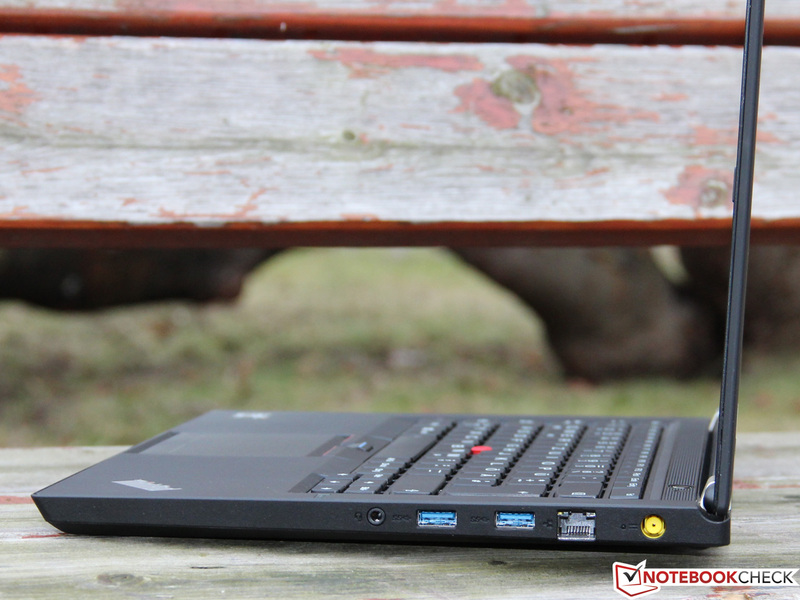 The compact size predestines the T430u for mobile use. One of the most important requirements is however that the content can be read outdoors without restrictions. This is unfortunately only possible in the shade with our test device. Although the surface is AR-coated, the brightness is not high enough to outshine direct sunlight. The screen exhibits more shortcomings in the viewing angle assessment, revealing the known weaknesses of other TN screens. The image quality wanes especially when looking from above or below and results in distorted colors and a decreasing contrast ratio. The lateral margin is a bit wider, but cannot compete with a high-end IPS or VA screen. The ThinkPad T430u is the first, and until now, only model from the T400 series that does not sport a conventional 35 Watt CPU, but an energy-efficient ULV processor with a TDP of merely 17 Watts. Although this has a positive effect on power consumption and temperature development, it also results in a performance loss. Our configuration is powered by a midrange Core i5-3317U that features two computing cores with a default clock of 1.7 GHz each. 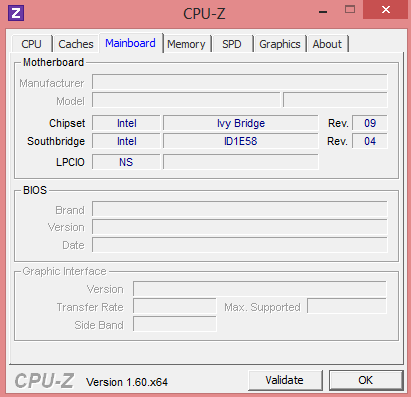 Depending on the load, the Ivy Bridge CPU can ignite a maximum Turbo Boost of 2.6 GHz and also make use of Hyperthreading technology. 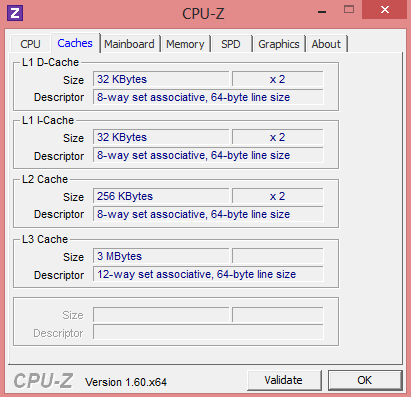 As usual, further details can be found in our CPU database. While most business laptops rely only on integrated graphic solutions, Lenovo additionally equips a few T430u models with a GeForce GT 620M. Nvidia's Optimus dynamically switches between the dedicated and integrated CPU so that the GeForce GT 620M is only active when it is really needed. Thus, only the efficient HD Graphics 4000 is enabled for video acceleration or undemanding tasks. 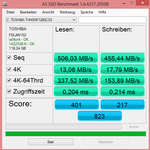 The T430u is not exactly generously equipped with a 4 GB working memory (1x 4 GB DDR3-1600 from Hynix), but it is enough. In return, the 128 GB SSD is particularly noteworthy since it promises short booting times and a very responsive system. The cooling is not always designed for ensuring the maximum Turbo speed during longer CPU full load, particularly in compact ultrabooks. Here, we have to compliment Lenovo. 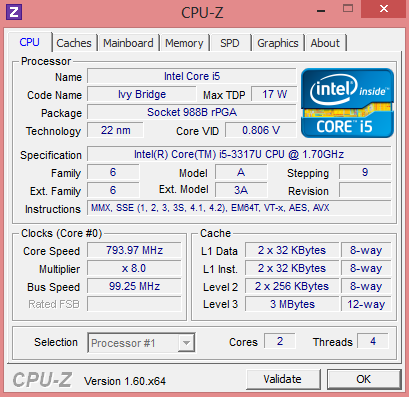 The Core i5-3317U in the T430u stably maintains its maximum clock of 2.4 (2 cores) and 2.6 GHz (1 core) even in extreme situations. This is reflected in good benchmark scores. The ThinkPad achieved 2.39 points in Cinebench R11.5 (64-bit), which is only roughly 20 percent less than with the 35 Watt Core i5-3210M model. 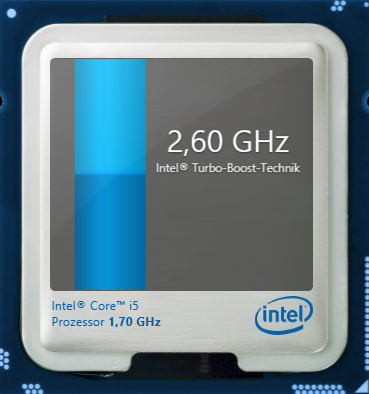 The much more expensive Core i7-3517U can only surpass this by 15 percent. The differences in the Cinebench R10 (64-bit) single thread test are equally slim. Our test device achieved 4508 points here. 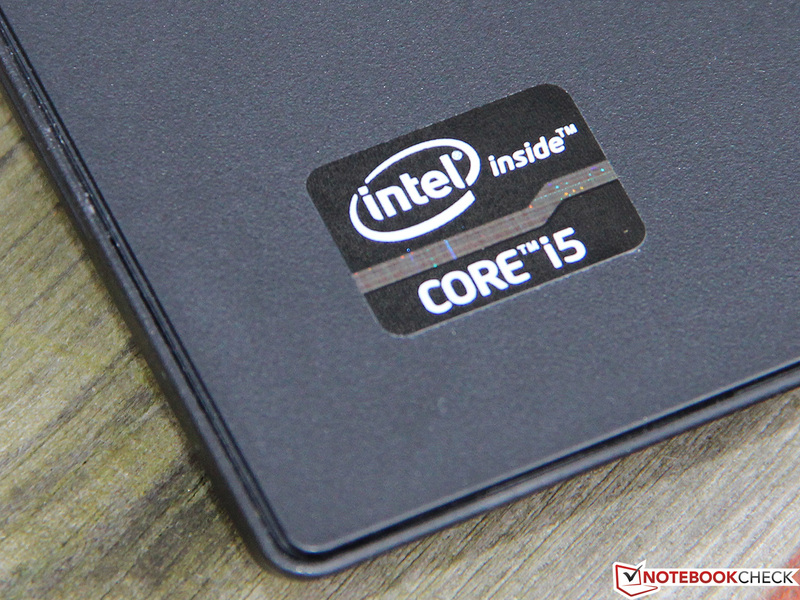 In our opinion, the i5-3317U is the perfect compromise of price, performance and power consumption. A fast storage device that makes loading programs and booting times is more important than the processor's performance in many situations. 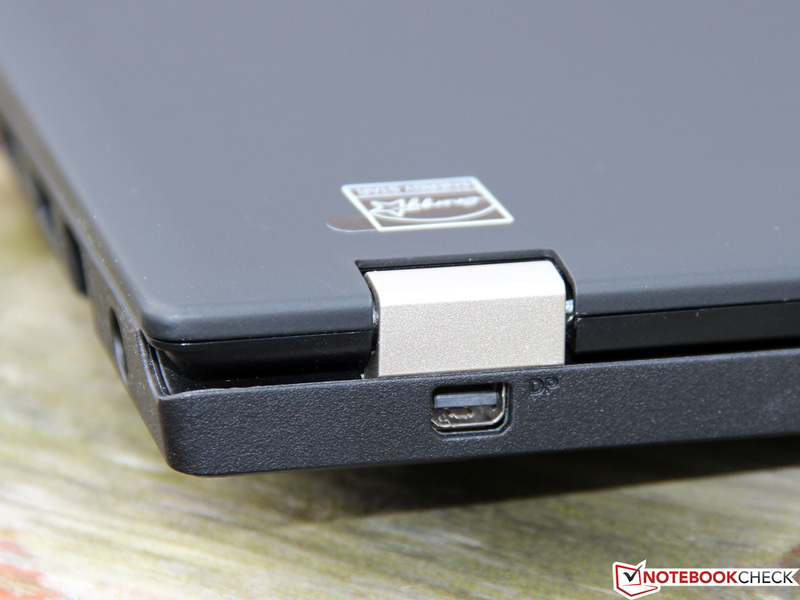 In line with that, Lenovo equips the ThinkPad with a swift SSD that comes from Toshiba and is dubbed THNSNF128GCSS. A 2.5-inch drive with a height of 7 millimeters (~0.276 in) is found. It is connected via SATA III and features a total flash memory capacity of 128 GB (19 nanometer MLC-NAND). The controller designed by Toshiba excels with extremely high transfer rates. The SSD can compete with the best models on the market due to a sequential transfer speed of 506 MB/s (read) and 455 MB/s (write). 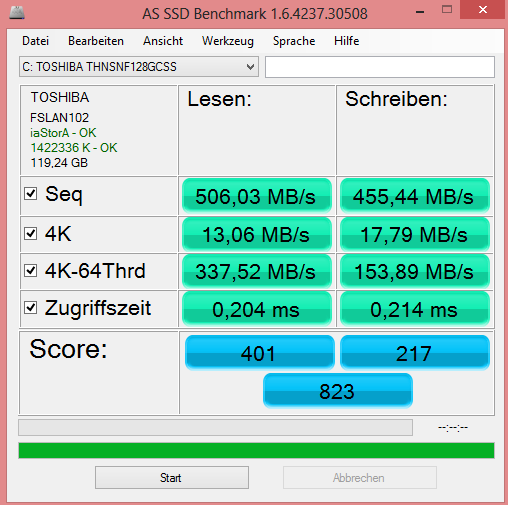 Although, for example, Samsung's SSD 830 processes small 4K files a bit faster, Toshiba's drive counters with superior performances in parallel read/write access (4K-64Thrd). The combination of a Core i5 processor and swift SSD lets the ThinkPad achieve an excellent system performance. With 4208 points in PCMark 7, the T430u is just behind Dell's Latitude E6430s (5896 points) and Fujitsu's LifeBook U772 (5039 points). However, this difference will hardly be noticed in practical use. The PCMark range only has a limited validity since it is a pure synthetic benchmark anyway. Therefore, we would like to briefly report about our subjective practical experience. We could hardly complain about not having enough power during our tests. The ULV processor easily coped with all routine applications and offered enough reserves to even occasionally deal with demanding tasks such as video transcoding. The fewest users will likely yearn for an even faster quad-core CPU. More impressive was the speed of the storage device. Windows 8 was ready to go in 10 seconds after a cold start and many programs started within fractions of a second - SSD power makes it possible. Although Intel's graphics solution has continuously improved over the past years, the current HD Graphics 4000 cannot yet compete with dedicated midrange GPUs from AMD or Nvidia. The ThinkPad T430u sports an additional GeForce GT 620M in order to deal with 3D applications and games anyway. It is based on the GF117 chip built in a 28 nanometer process, which integrates 96 Shader units (Fermi architecture). 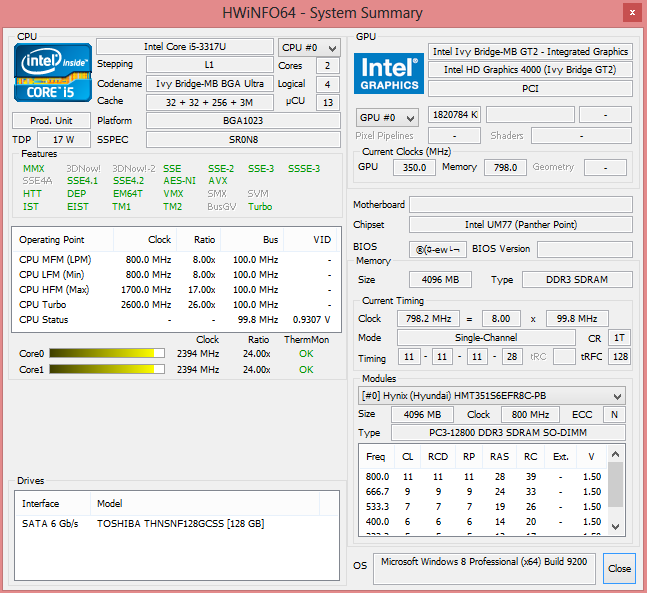 Regrettably, Lenovo seems to have disabled the optional Turbo Boost in the GT 620M so that the core's clock rate is a low 625 MHz. The frequency of the 1 GB DDR3 VRAM (900 MHz, 64-bit) remains unaffected from that. The GeForce GT 620M outperformed the HD 4000 by a good 50 percent in most benchmarks and achieved 1011 points in 3DMark 11 (performance preset). This roughly corresponds to AMD's Radeon HD 7650M. The gaming performance of a business laptop like the T430u is certainly a more secondary issue. However, the ThinkPad is quite suitable to render most up-to-date games smoothly, providing the user makes compromises in resolution and details. 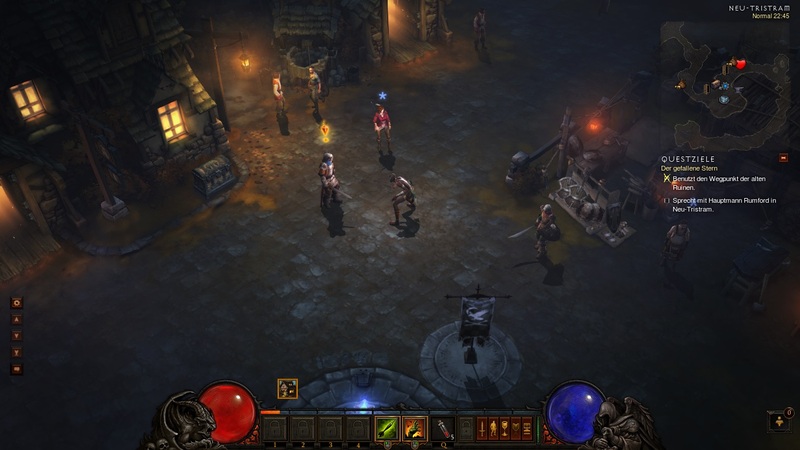 The ultrabook even provided playable frame rates in the screen's native resolution and high settings for Diablo 3 and Dishonored. 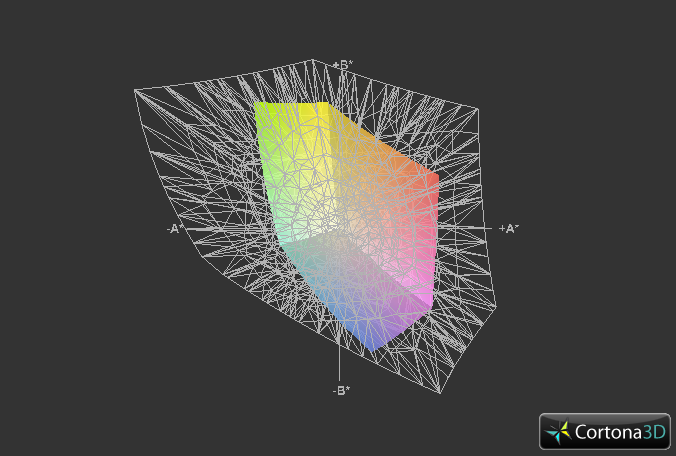 Even anti-aliasing can be enabled on a low level to enhance the image quality. Anno 2070 and particularly Battlefield 3 have much higher requirements on the GT 620M and consequently, only 1024x768 pixels and low or medium details should be selected. In contrast to contenders featuring an integrated graphics, it is a clear improvement. 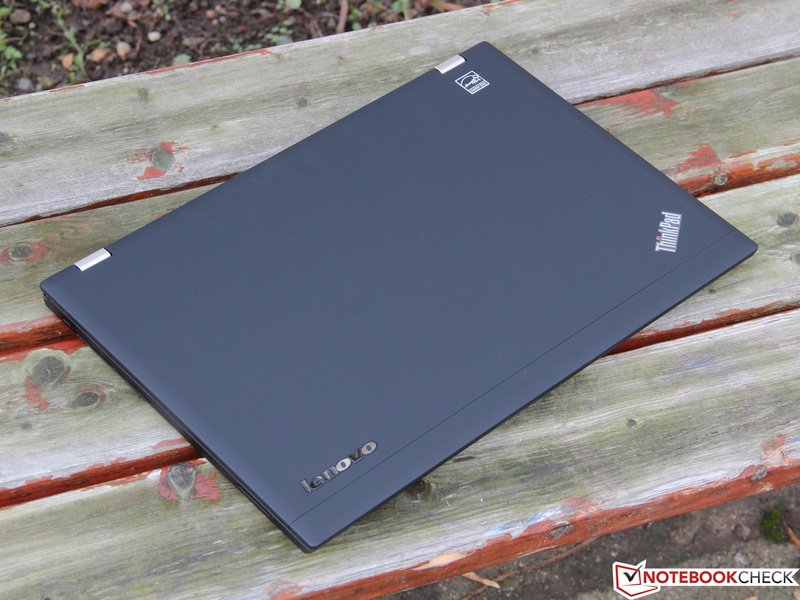 Lenovo has created an extremely quiet ultrabook with the ThinkPad T430u in almost every operating state. Although the fan is never completely disabled even at idle, the low noise level of 30.9 to 31.1 dB (A) is extremely quiet. The device is virtually silent in most surroundings. The fan stably maintains its low speed in routine use with office programs, Internet browsing and similar applications. 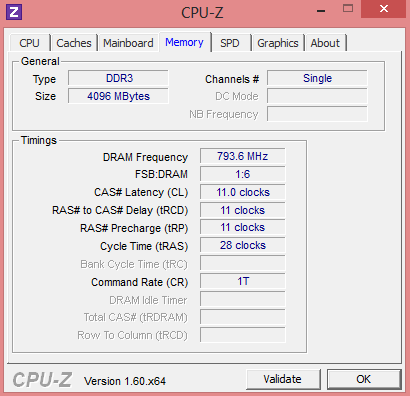 The noise increases during long CPU or graphics-heavy software use. We ascertained a rate of 32.9 dB (A) in 3DMark 06 here. 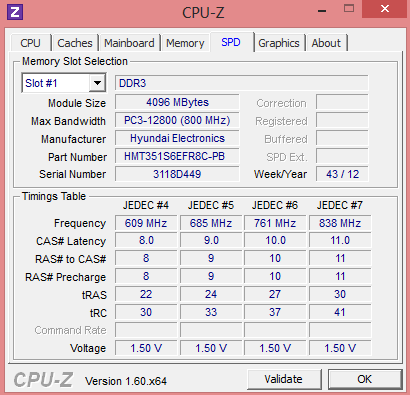 Some laptops have already achieved higher rates in idle operation. The fan's low-pitched frequency and steady noise contribute to this and ensures that the ThinkPad remains in the background acoustically. 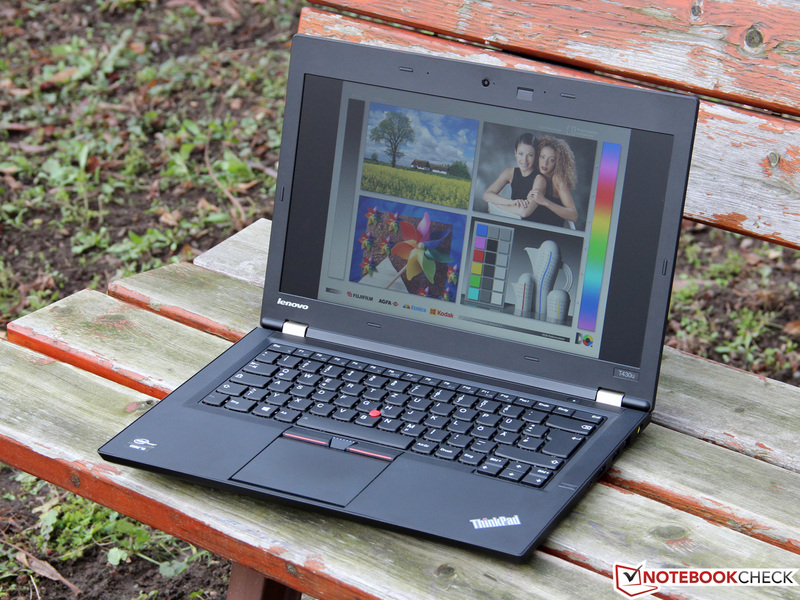 The T430u takes a top position in comparison with the contenders. Now if you fear that the low noise level involves high temperature development, the laptop's cooling system not only works quietly but also very efficiently. The casing only heats up insignificantly during load and hardly exceeds 30 degrees Celsius (~86 degrees Fahrenheit). Thus, using the device on the lap is no problem. The rates climbed to approximately 40 °C (~104 °F) when the hardware was stressed. However, the heat was mostly concentrated in the rear area. In return, the wrist rest remained a bit cooler so that the user can continue to work comfortably. We simulate the nightmare of every laptop using our stress test. Prime95 and FurMark demand everything from our test devices for at least one hour. Although this is hardly ever the case in real life, neither the processor nor the graphics card should overheat or throttle in this situation. Neither case applies to the T430u. 87 °C (~188.6 °F) on the Core i5 and 68 °C (~154.4 °F) on the GT620M are absolutely uncritical; especially since they both stably maintained their maximum clock. (±) The average temperature for the upper side under maximal load is 37 °C / 99 F, compared to the average of 30.7 °C / 87 F for the devices in the class Subnotebook. (±) The average temperature of the palmrest area of similar devices was 28.6 °C / 83.5 F (-1.9 °C / -3.4 F). Unfortunately, it is almost traditional for ThinkPads to have weak speakers and the T430u is no exception. The playback makes a very treble-heavy impression while low pitches are almost completely absent. The only plus point is the acceptable maximum volume, which even allows medium-sized rooms to be filled with sound. In view of quality, it is definitely recommendable to connect external speakers, which is possible via the digital DisplayPort or HDMI, as well as over the analog audio jack. The T430u's power consumption ranges on the level of comparably configured laptops. With 7.2 to 10.9 Watts at idle, the ThinkPad is even on a par with laptops that do not feature a dedicated graphics card, which is particularly due to Nvidia's Optimus. Interestingly, the power consumption during load and enabled GeForce GPU remained modest. 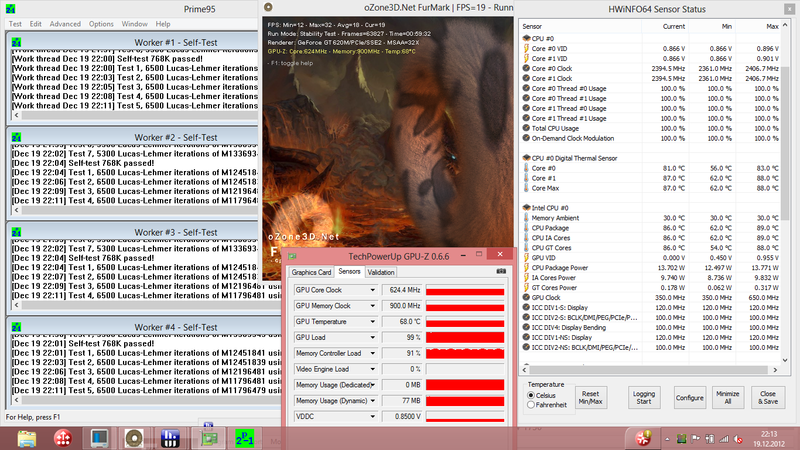 We merely measured just below 37 Watts in 3DMark 06 - so 3 to 4 Watts more than with the noticeably weaker HD Graphics 4000. The GT 620M obviously benefits from its low clock rate and the 28 nanometer processing, and is thus especially efficient. The included 65 Watt PSU is more than sufficiently sized and also easily coped with our stress test (42.4 Watts). 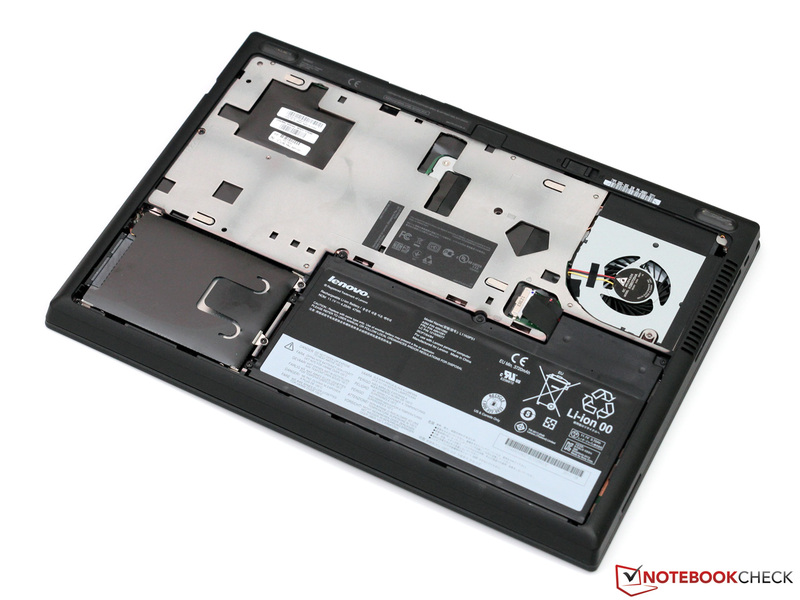 Like in most ultrabooks, the T430u's battery is not removable. Unlike the T430 and T430s, it cannot be expanded due to the lack of an UltraBay slot. 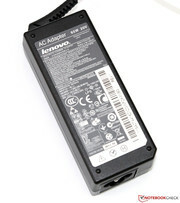 The lithium-polymer battery features a capacity of 47 Wh, which is to achieve a maximum runtime of 6.6 hours according to Lenovo. We recorded 6 hours and 16 minutes via the Battery Eater's Reader's test (energy-saving mode, wireless modules and GPU off, minimum brightness) in our assessments and can thus confirm the manufacturer's specifications. The user can count on approximately 3 to 4 hours in practical use. Exactly 3 hours and 25 minutes in our standardized Wi-Fi test (energy-saving mode, GPU disabled, 150 cd/m²) is not a bad time. However, it is at best average for this device category (LifeBook U772: 5 hours 17 minutes). The Battery Eater's Classic test (high-performance, wireless module and GPU enabled, maximum brightness) reduced the battery runtime to almost two hours. 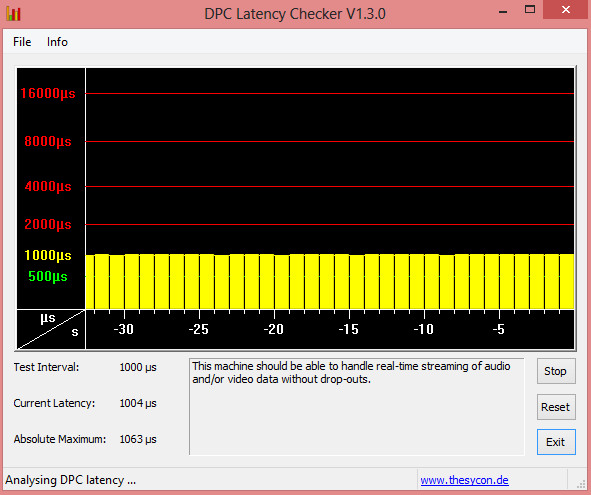 The full performance is demanded from the processor and graphics card here and they are not artificially throttled. The user can thus rely on the full speed away from the mains. This much is certain: The tried ThinkPad recipe also works perfectly in ultrabook size. Although the T430u has room for improvement, it fuses many of the strengths that have been valued by regular customers for now 20 years. Among them, a solid and well-processed casing that does not feature the elegance of a unibody chassis, but excels with very useful qualities, such as matte surfaces or long-lasting metal hinges. 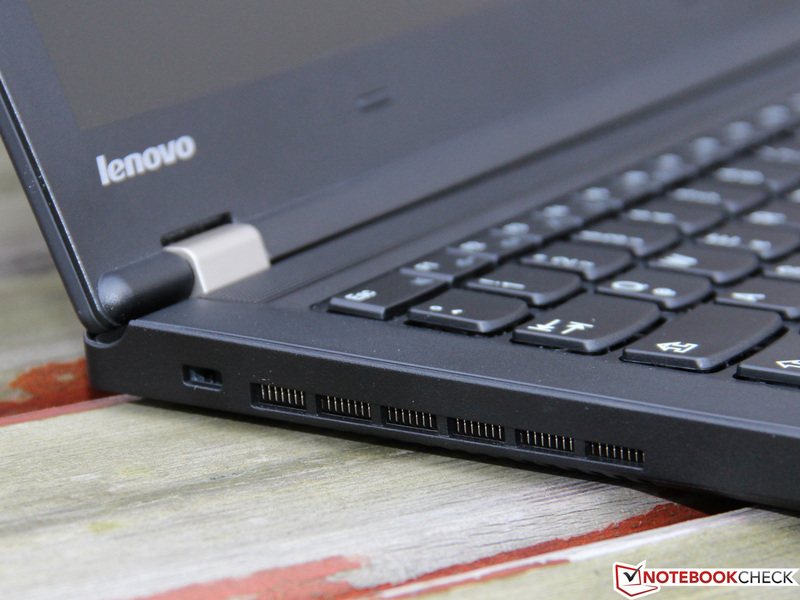 Especially noteworthy are the high-quality input devices that Lenovo also continually improves. Our past complaints have been heard and a bigger touchpad is now finally implemented. The traditional TrackPoint is naturally also still incorporated. 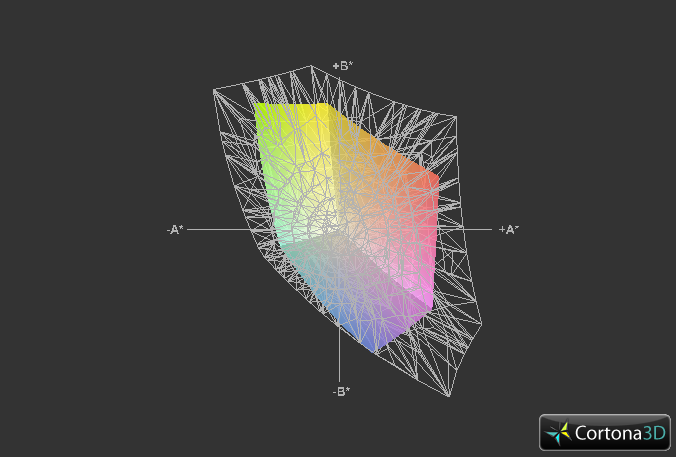 However, where there is light there is also shadow, and this can literally be transferred to the screen in this case. Much worse than the TN screen's unsatisfactory quality is the weak backlight, which restricts outdoor suitability. The battery runtimes also lag behind the top rates in this device category. 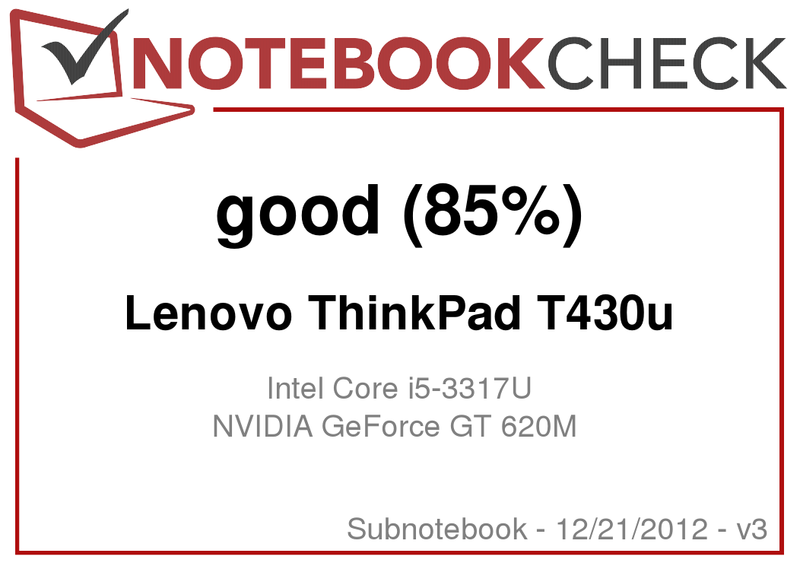 The ThinkPad can score again in performance. Virtually every ultrabook offers a Core i5 processor and a swift SSD, but only a few contenders offer an additional GeForce GPU option. 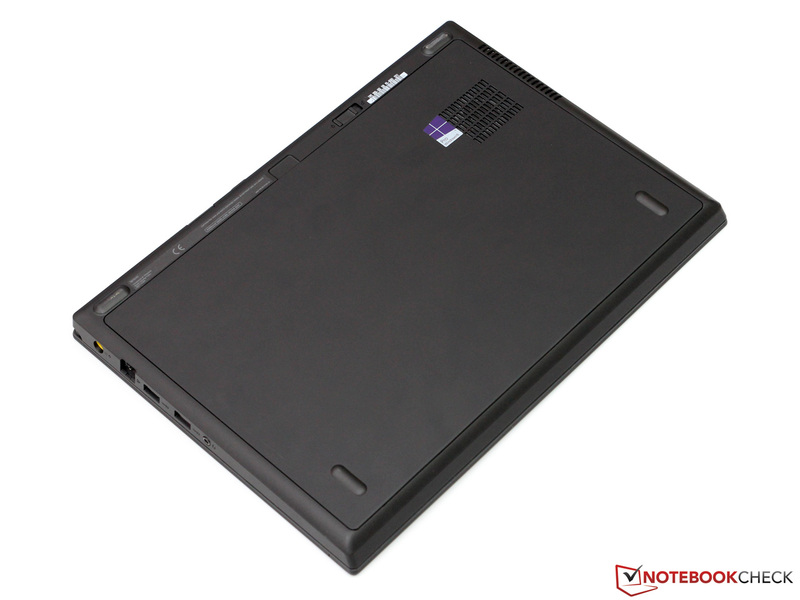 It ensures that the T430u can replace a full-blown laptop in games and 3D applications. Lenovo also keeps absolute control over the emissions; hardly a comparable device stays this cool and quiet. 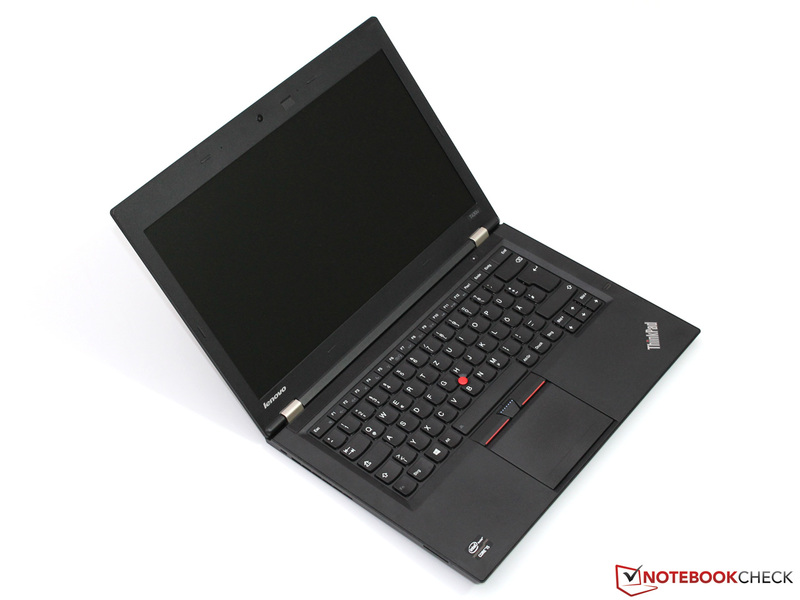 In a nutshell, we can say that the T430u is an attractive laptop for business and private customers alike if the buyer can relinquish the last ounce of mobility. The current price of 950 Euros (~$1241) is fair throughout considering the given offerings. A new ThinkPad is born! as well as the touchpad belong to the best of their kind. that are cooled very quietly even during load. It can be opened to a wide extent without tools. and the fan can be cleaned. The battery is incorporated in the casing, but only with screws. A 720p webcam allows taking pictures and videos. A fingerprint scanner is to take care of security. there are not many novelties to be discovered. and relies on matte black surfaces as well as retro looks. 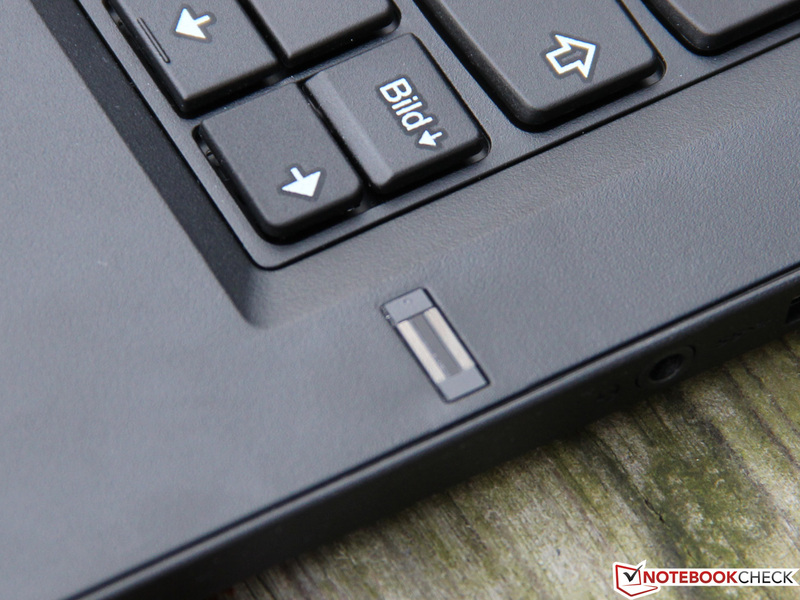 The thickness of 2.1 centimeters clearly undercuts that of the T430 and T430s. and have a firm grip on the screen even on shaky surfaces. The maximum opening angle is over 180 degrees. Regrettably, cutbacks have been made in connectivity. Now there are only two USB ports and no docking station. The card reader supports SD and MMC models. A 65 watt PSU takes care of power supply. If you can live without the additional interfaces and expandability of the T430(s), the ThinkPad T430u could be an interesting alternative. The excellent inputs and the familiar high-quality workmanship are a matter of course even in this slim scion of the T400 range. A few of the most important ultrabook qualities - weight, battery life and screen brightness - regrettably come a bit short in the T430u. If you are looking for a laptop uncompromisingly designed for mobility, you will be better off with the competition. 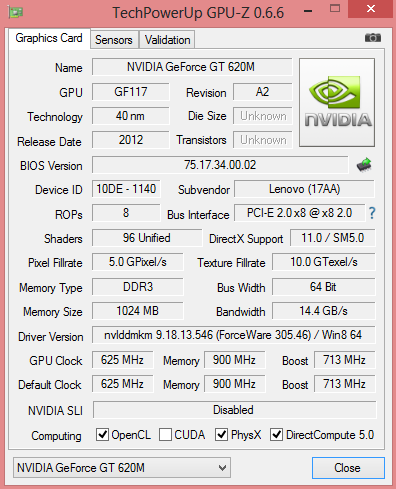 The additional GeForce graphics card is quite unusual in a business device. It also makes the ThinkPad interesting for casual gamers. 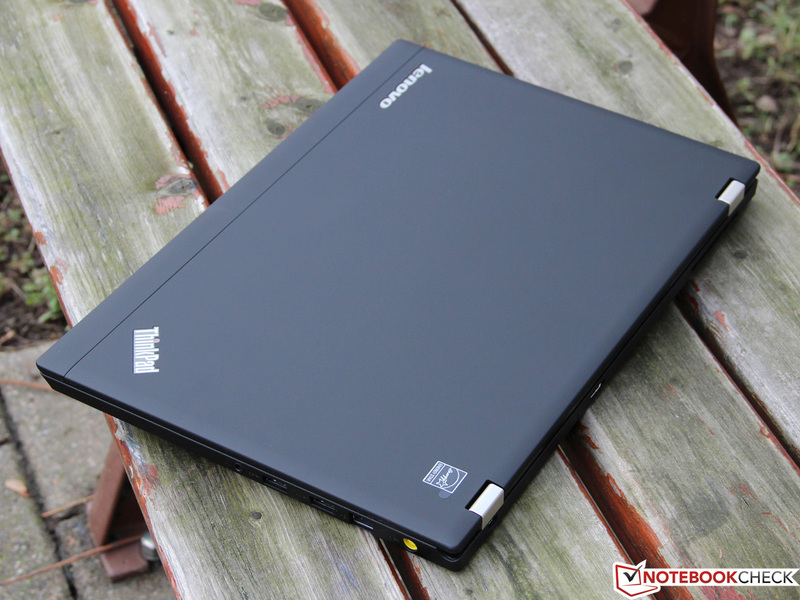 The T430u competes with both other ultrabooks as well as premium Office laptops. Dell's Latitude E6430s, Fujitsu's Lifebook U772, Acer's Aspire M5-481TG, Samsung's 535U4C or Asus' UX32VD are possible alternatives.